디바이스의 물리적 위치를 확립하기 위한 시스템 및 방법의 실시예들이 여기서 전반적으로 설명된다. Embodiment of a system and method for establishing the physical location of the device, for example, are described herein as a whole. 일부 실시예들에서, 디바이스는, 무선 프로토콜의 사용을 통해 액세스 포인트와 통신하고, 3-스테이지 정밀-타이밍 측정(fine-timing measurement: FTM) 절차를 포함하는 ToF(time-of-flight) 포지셔닝을 위한 방법을 수행하되, 상기 3-스테이지 FTM 절차는 다음의 FTM 교환을 위한 컴백 타이밍을 협상하는 제 1 스테이지와, 정밀 타이밍 측정 교환을 수행하는 것 및 다음의 정밀 타이밍 측정 교환을 위한 컴백 타이밍을 선택적으로 협상하는 것을 포함하는 제 2 스테이지와, 이전의 정밀 타이밍 측정 교환의 타임스탬프를 보고하고 폴링하는 것 및 추가적인 정밀 타이밍 측정 스테이지를 선택적으로 수행하는 것을 포함하는 제 3 스테이지를 포함한다. In some embodiments, the device, the access point and the communication, and three-stage precision through the use of wireless protocols timing measurement: the (fine-timing measurement FTM) ToF (time-of-flight) positioning comprises the steps but carrying out the method for the three-stage process is optionally the FTM to perform the first stage, and a precise timing measurement to negotiate the exchange comeback timing for the next replacement of the FTM comeback and the timing for the next replacement of the precision timing measurement and a second stage comprising a negotiation, and a third stage that involves looking at the time stamps of the previous precision timing measurement performed in the exchange and selective to polling and additional precision timing measurement stage. 일부 실시예들에서, 디바이스에서의 모듈은 디바이스와 액세스 포인트와의 사이에서 또는 하나 이상의 네트워크 디바이스들 사이에서의 레인지(a range)를 결정할 수 있다. In some embodiments, the modules in the device can determine the range (a range) of between and from a device with an access point, or one or more network devices. 본 특허 출원은 2013년 9월 18일에 출원된 미국 임시 특허 출원 일련 번호 제61/879,301호에 대한 우선권을 주장하며, 이는 그 전체로서 본 명세서에 참조되어 인용된다. The present patent application claims priority to U.S. Provisional Patent Application Serial No. 61/879 301, filed on September 18, 2013, which is incorporated by reference herein in its entirety. 실시예들은 무선 통신에 관련되어 있다. Embodiments are related to wireless communication. 일부 실시예들은 TOF(time-of-flight) 포지셔닝 및 디바이스 위치 결정 무선 네트워크에 관한 것이다. Some embodiments relate to a TOF (time-of-flight), and the positioning device positioning a wireless network. 일부 실시예들은 IEEE 802.11 표준들 중 하나에 따라 동작하는 무선 네트워크에 관한 것이다. Some embodiments relate to a wireless network that operates in accordance with one of the IEEE 802.11 standard. 일부 실시예들은 무선 지리 위치(geo-location)의 사용에 관한 것이고, 보다 구체적으로, 일부 실시예들은 무선 네트워크를 구비한 공간 내에서의 디바이스 위치의 결정에 관한 것이다. Some embodiments relate to the use of wireless geographical location (geo-location), and more particularly, some embodiments relate to a determination of the location of the device within the area with the wireless network. 무선 네트워크 디바이스들 위치를 정확하게 찾는 것은 다수의 지상파 소스들로부터 다수의 위치 결정을 수행하는 것과 연관된 계산 비용을 초래할 수 있다. To find the correct wireless network device location can result in a computation cost associated with performing a number of position determination from a plurality of terrestrial source. 이 계산 비용은 디바이스의 다른 프로세싱 활동에 영향을 미칠 수 있고, 또한 추가적인 전력 소비를 초래할 수 있어, 이는 디바이스의 성능 또는 유용성을 저하시킬 수 있다. The calculated cost may affect the activity of the other processing devices, and can lead to additional power consumption, which can degrade the performance or usability of the device. 따라서, 무선 디바이스의 위치를 정확하게 찾는 것과 연관된 비용을 낮추는 시스템 및 방법에 대해 일반적으로 요구된다. Accordingly, it is generally required for the system and lowering costs associated to finding the correct location of the wireless device. 일부 실시예들은 비제한적인 예로서 첨부된 도면들에 도시되어 있다. Some embodiments are illustrated in the accompanying drawings by way of non-limiting example. 도 1은 일부 실시예들에 따른 예시적인 통신 시스템의 블록도이다. Figure 1 is a block diagram of an exemplary communication system in accordance with some embodiments. 도 2는 일부 실시예들에 따른 예시적인 무선 통신 시스템의 블록도이다. Figure 2 is a block diagram of an exemplary wireless communication system in accordance with some embodiments. 도 3은 일부 실시예들에 따라 액세스 포인트로 디바이스의 포지션을 결정하기 위한 방법의 동작을 나타내는 스윔-레인 챠트(a swim-lane chart)이다. Figure 3 is a swim diagram illustrating a method of operation for determining the position of the device to the access point according to some embodiments - is a lane chart (a swim-lane chart). 도 4는 일부 실시예들에 따라 액세스 포인트로 디바이스의 상호 작용을 모니터링하기 위한 방법의 동작을 나타내는 스윔-레인 챠트이다. 4 is a swim diagram illustrating a method of operation for monitoring the interaction of the devices to the access point according to some embodiments - is a chart lane. 도 5는 일부 실시예들에 따라 디바이스의 포지션을 결정하기 위한 예시적인 방법을 나타내는 흐름도이다. 5 is a flow chart illustrating an exemplary method for determining a position of a device in accordance with some embodiments. 도 6은 일부 실시예들에 따라 사용자 장치(UE)의 기능 블록도를 나타낸다. 6 shows a functional block diagram of a user equipment (UE), in accordance with some embodiments. 도 7은 일부 실시예들에 따라 모바일 디바이스를 나타내는 블록도이다. 7 is a block diagram illustrating a mobile device, in accordance with some embodiments. 도 8은 본 명세서에서 논의되는 방법론들 중 임의의 하나 이상의 방법론을 머신으로 하여금 수행하게 하는 인스트럭션의 세트가 실행될 수 있는 컴퓨터 시스템의 예시적인 형태로 상기 머신을 도형적으로 표현한 도면이다. 8 is a diagram representation of the machine as a Graphical in exemplary form of a computer system that can be a set of instructions executed to perform one of the methods discussed herein allow for any one or more of the methodologies of the machine. 이하의 설명 및 도면은 당업자가 이것들을 실시할 수 있게 하도록 특정 실시예들을 충분히 예시하고 있다. Description and drawings are sufficiently illustrate specific embodiments to enable those skilled in the art to practice them. 다른 실시예들은 구조적, 논리적, 전기적, 프로세스, 및 다른 변경들을 포함할 수 있다. Other embodiments may include structural, logical, electrical, process, and other changes. 일부 실시예들의 부분들 및 특징들은 다른 실시예들의 부분들 및 특징들에 포함되거나 그것들을 위해 대체될 수 있다. Parts and features of some embodiments may be substituted for or included in those portions and features of the other embodiments. 청구항들에서 제시된 실시예들은 그 청구항들의 모든 이용가능한 등가물들을 포함한다. Embodiments set forth in the claims include all available equivalents of those claims. 여기서 설명되는 다수의 기술 및 구성은 무선 통신 및 네트워크 통신과 관련해서 사용되는 위치 발견 기술(a location discovery technique)을 제공한다. A number of techniques and configurations described herein provides a location discovery technique used in connection with a wireless communication network and communication (a location discovery technique). 현재 설명되는 위치 결정 기술은 디바이스들과 액세스 포인트들 간의 무선 통신과 관련해서 사용될 수 있다. Positioning techniques currently described may be used in connection with a wireless communication between the devices and the access point. 예컨대, 무선 로컬 영역 네트워크(예를 들어, 와이파이)는 IEEE 802.11 표준들 중 하나에 기초하거나 그와 호환가능할 수 있다. For example, a wireless local area network (e.g., WiFi) may be compatible with the base or on one of the IEEE 802.11 standard. 일부 네트워크 기술들에 의하면, 디바이스의 위치를 확립하는 것은 디바이스와 다수의 액세스 포인트 간의 거리를 계산하는 데 TOF(time of flight) 계산을 이용한다. According to some of the network technology, it is established that the position of the device utilizes the device and the number of access TOF (time of flight) to calculate the distance between the points calculated. 예컨대, 디바이스는 각각의 개별적인 액세스 포인트로부터의 물리적 거리를 확립하기 위해 2 이상의 액세스 포인트들로부터 TOF 정보를 요청하고, 그에 의해 액세스 포인트들과 관련해서 디바이스의 대략적인 물리적 위치를 결정할 수 있다. For example, the device may determine the approximate physical location of the device in relation to request the TOF information, the access point whereby from two or more access points to establish a physical distance from each respective access point. 액세스 포인트의 물리적 위치가 공지되어 있는 예에서, 액세스 포인트들은 그 정보를 디바이스에게 제공할 수 있어, 디바이스가 단독으로 또는 액세스 포인트들과 함께, 디바이스의 정확한 물리적 위치를, 예를 들어 네비게이션 좌표계에서의 경도값 및 위도값의 세트로서 결정할 수 있다. In the example in which the physical location of the access point is known, the access points are in an exact physical position it is possible to provide the information to the device, the device is with alone or access point, a device, such as a navigation coordinate system It can be determined as a set of a longitude value and a latitude value. 현재 설명되는 기술들과 관련해서, 무선 통신 디바이스는 무선 통신 액세스 포인트와의 접속을 수립하는 데 이용된다. In connection with the presently described technology, a wireless communication device is used to establish a connection with a wireless communication access point. 예에서, IEEE 802.11v와 같은 IEEE 802.11 표준은, ToF가 결정될 수 있는 프레임 교환을 정의할 수 있지만, 모바일 디바이스가 항상 응답을 수신할 수 있다고 가정될 수 있다. In the example, IEEE 802.11 standards such as IEEE 802.11v is, but ToF to define the frame exchange that can be determined, it can be assumed that the mobile device is always a response is received. 그러나, 응답이 도착할 때까지 요청된 채널에 모바일 디바이스를 강제로 머무르게 하여, (서빙 채널이 현재 ToF 교환 채널과 같지 않으면) 디바이스가 서빙 채널로 되돌아가지 못하게 되는 경우, ToF 계산은 수 밀리초가 걸릴 수 있다. However, in response to the stay forces the mobile device to the requested channel until it arrives, (the serving channel if the current equal to the ToF exchange channel) if the device is not let back into the serving channel, ToF calculated to take is milliseconds have. 이는 디바이스가 임의의 전력 절약 기술을 수행하지 못하게 하거나, 혹은 상이한 채널에서 AP와의 추가적인 교환을 수행하지 못하게 한다. This prevents the device from performing an additional exchange with the AP in preventing, or different channels to perform any power saving techniques. 또한, 향후의 ToF 측정 교환을 한쪽(또는 양쪽)에게 준비시키기 위한 디바이스와 수신 AP 간의 사전 상호동작으로 인해 ToF 계산 리소스들은 항상 이용될 수는 없었다. Further, due to the pre-interaction between the device and the receiving AP for preparing a one (or both) of the further measuring ToF exchange ToF calculated resources are no always be used. 위치 결정 정확성을 위해 요구되는 삼변 측량(trilateration)을 가능하게 하기 위해, 디바이스는 다수의 AP들과 ToF 교환을 수행할 수 있다. To enable trilateration (trilateration) required for the positioning accuracy, the device may perform a number of the AP and ToF exchange. 예컨대, 액세스 포인트들이 스펙트럼에 걸쳐서 주파수 확산되는 엔터프라이즈 환경에서, 모바일 디바이스가 채널에 머무르고 및/또는 채널 밖으로 나가기 위한 추가적인 시간이 필요할 수 있고 또한 상이한 채널들에 대해 설정된 관련 ToF 지원 AP들의 개수와 곱해질 수 있다. For example, access points in an enterprise environment in which the frequency spread over the spectrum, the mobile device may need additional time for staying in the channels and / or channel egress may also be multiplied to the number of associated ToF support AP is set for the different channels can. 일부 실시예들에서, ToF 포지셔닝 방법은 개시 스테이션(an initiating station) 및 응답 스테이션(a responding station)에 의해 수행되는 3-스테이지 정밀-타이밍 측정(FTM; fine-timing measurement) 절차를 포함할 수 있다. In some embodiments, ToF positioning method disclosed station (an initiating station) and the response station (a responding station) 3- precision stage that is carried out by - timing measurements; may include (FTM fine-timing measurement) process . 방법은 다음의 FTM 교환을 위한 컴백 타이밍을 협상하는 제 1 스테이지(스테이지 I); Method includes a first stage (stage I) to negotiate the comeback timing for the next replacement of the FTM; 정밀-타이밍 측정 교환을 수행하는 것과, 다음의 정밀-타이밍 측정 교환을 위한 컴백 타이밍을 선택적으로 협상하는 것을 포함하는 제 2 스테이지(스테이지 II); With performing timing measurements exchange, the following precision of-the-precision second stage (stage II), which comprises selectively negotiate the comeback timing for timing measurements exchange; 및 이전의 정밀 타이밍 측정 교환의 타임스탬프를 보고 및 폴링하는 것과, 추가적인 정밀-타이밍 측정 스테이지를 선택적으로 수행하는 것을 포함하는 제 3 스테이지(스테이지 III)를 포함할 수 있다. And prior to that report, and polls the time stamp of the precision timing measurement exchange, additional precision may include a third stage (stage III), which comprises selectively perform a timing measurement stage. 이들 위치 결정 기술들은 요구되는 ToF 리소스들을 관리 및 준비하는 능력을 ToF 응답자, 예를 들어 액세스 포인트에게 제공할 수 있다. These positioning technology can provide the ability to manage and the resources required to prepare the ToF ToF respondents, for example, an access point. 기술들은 또한 응답자 리소스들을 기다리는 동안에 병렬 동작들을 수행하는 능력을 ToF 개시자(예를 들어, STA 또는 디바이스)에게 제공할 수도 있고, 이러한 동작들은 전력 절약, 다른 응답자에 의한 추가적인 ToF 요청들의 성능, 서빙 채널 트래픽의 처리, 또는 다른 기능들을 포함할 수 있다. Techniques may also responder resource discloses the ability to perform parallel operation ToF while waiting for the character may be provided to (e.g., STA, or the device), such operations are power saving and performance, the serving of additional ToF request by the other respondents It may include a process, or other functions of the traffic channel. 또한, 여기서 설명되는 ToF 인프라스트럭처 프로토콜들은 위치 결정 프로토콜들에 대한 추가적인 확장, 예를 들어 견고하고 잘 정의된 에러 처리 메카니즘들과 함께, 항시 ToF 리소스들의 완전한 이용가능성, 고속의 채널 추정 계산을 제공한다. Also, ToF infrastructure protocols that are described herein positioning with additional extensions, for example, robustness and process well-defined error mechanisms for the protocols, and always provides full availability, high speed of channel estimation calculation of the ToF resources . 이들 위치 결정 기술들은, IEEE 802.11 표준과의 접속에서 수행되는 와이파이 통신(예를 들어, 고정형 액세스 포인트에 의해 가능하게 되는 와이파이 통신), 3GPP LTE/LTE-A 통신(예를 들어, 업링크 세그먼트 또는 다른 지정된 리소스들의 일부에서 수립된 LTE 다이렉트(LTE-D) 통신), IEEE 802.16 표준과 관련해서 수행되는 머신-투-머신(M2M; machine-to-machine) 통신 등을 포함한, 허가 또는 비허가 스펙트럼 대역들에서의 표준들 및 다수의 네트워크 프로토콜들 중 임의의 것을 이용하여 디바이스 위치의 결정을 가능하게 할 수 있다. These positioning techniques, WIFI communication (e.g., a Wi-Fi communication is made possible by the fixed access points), 3GPP LTE / LTE-A communication carried out in connection with the IEEE 802.11 standard (e. G., Uplink segment or the LTE direct (LTE-D) communications), a machine that is performed in relation to the IEEE 802.16 standard established in some other specified resource-to-machine (M2M; including machine-to-machine) communication, etc., permit or unlicensed spectrum of standards and a number of network protocols at the band it may enable the determination of the device locations using any of it. 도 1은 통신 네트워크 구조(100)의 예시적인 구성을 도시한다. Figure 1 illustrates an exemplary configuration of a communication network architecture 100. 통신 네트워크 구조(100) 내에서, IEEE 802.11 호환가능 무선 액세스 포인트 또는 3GPP 표준 계열로부터의 표준에 따라 동작하는 LTE/LTE-A 셀 네트워크와 같은 캐리어 기반 네트워크는 네트워크 장비(102)에 의해 수립된다. Communication network architecture 100 in a carrier-based network, such as the operating LTE / LTE-A cell network according to the IEEE 802.11 compatible wireless access point or the standard from the 3GPP family of standards is established by the network device 102. The 네트워크 장비(102)는 무선 액세스 포인트, 와이파이 핫스팟, 혹은 통신 디바이스들(104A, 104B, 104C)(예를 들어, 사용자 장치(UE) 또는 통신 스테이션(STA))과 통신하는 개선된 또는 진화된 노드 B(eNodeB)를 포함할 수 있다. Network equipment 102 is a wireless access point, a WiFi hotspot, or communication devices (104A, 104B, 104C) (e.g., user equipment (UE) or a communication station (STA)), an improved or evolved Node that communicates with the It can include B (eNodeB). 캐리어 기반 네트워크는 통신 디바이스들(104A, 104B, 104C) 각각에 의한 무선 네트워크 접속들(106A, 106B, 106C)을 포함한다. The carrier-based network comprises a communication device (104A, 104B, 104C) of the wireless network access by each (106A, 106B, 106C). 통신 디바이스들(104A, 104B, 104C)은 스마트폰, 휴대폰 핸드셋, 및 내장 또는 외부의 무선 네트워크 통신 디바이스를 갖는 퍼스널 컴퓨터를 포함해서 다양한 폼 팩터를 따르는 것으로 도시되어 있다. The communication devices (104A, 104B, 104C) is shown according to a variety of form factors, including a personal computer having a smart phone, a cellular phone handset, and internal or external to the radio network communication device. 네트워크 장비(102)는 클라우드 네트워크(116)에서의 네트워크 서버(118)에 네트워크 접속(114)을 통해 연결되어 있는 것으로 도 1에 도시되어 있다. Network equipment 102 is shown in Figure 1 as being connected via a network connection 114 to the network server 118 in the network cloud 116. 서버(118)는 디바이스 위치, 사용자 프로파일, 사용자 정보, 웹 사이트, 이메일 등을 포함한 다양한 형태의 정보를 통신 디바이스들(104A, 104B, 104C)로 제공하거나, 혹은 정보를 통신 디바이스들(104A, 104B, 104C)로부터 수신하도록 동작할 수 있다. Server 118 is a device location, user profile, user information, Web sites, providing various types of information, including e-mail, etc. to the communication device (104A, 104B, 104C), or the communication device information (104A, 104B It can be operable to receive from the 104C). 여기서 설명되는 기술들은, 하나 이상의 네트워크 장치와 통신 세션을 수립할 것을 다수의 통신 디바이스들에게 요구하지 않고서, 네트워크 장비(102)와 관련하여 다수의 통신 디바이스들(104A, 104B, 104C)의 위치 결정을 가능하게 한다. The techniques described herein, determining the position of one or more without required to establish a network device and a communications session to a plurality of communication devices, the multiple communication devices with respect to network devices (102) (104A, 104B, 104C) to enable. 통신 디바이스들(104A, 104B, 104C)은 무선 통신을 위한 범위 내에 있거나 그렇지 않으면 그 근처에 있을 때에 네트워크 장비(102)와 통신할 수 있다. The communication devices (104A, 104B, 104C) may communicate with network device 102 when in the neighborhood or otherwise within range of a wireless communication terminal. 도시된 바와 같이, 접속(106A)은 모바일 디바이스(104A)(예를 들어, 스마트폰)와 네트워크 장비(102) 사이에서 수립될 수 있고; As shown, the connection (106A) may be established between the mobile device (104A) (e.g., a smart phone) and a network equipment (102); 접속(106B)는 모바일 디바이스(104B)(예를 들어, 휴대폰)와 네트워크 장비(102) 사이에서 수립될 수 있고; Connection (106B) can be established between the mobile device (104B) (e.g., mobile phone) and a network equipment (102); 접속(106C)은 모바일 디바이스(104C)(예를 들어, 퍼스널 컴퓨터)와 네트워크 장비(102) 사이에서 수립될 수 있다. Connecting (106C) can be established between the mobile device (104C) (e.g., personal computer) and a network equipment (102). 디바이스들(104A, 104B, 104C) 간의 무선 통신(106A, 106B, 106C)은 와이파이 또는 IEEE 802.11 표준 프로토콜, 혹은 기존의 3GPP LTE TDD(time division duplex)-어드밴스드 시스템과 같은 프로토콜을 이용할 수 있다. The wireless communication device (106A, 106B, 106C) between (104A, 104B, 104C) is a Wi-Fi or IEEE 802.11 standard protocol, or a (time division duplex) existing 3GPP LTE TDD - may use a protocol such as Advanced system. 일 실시예에서, 통신 네트워크(116) 및 네트워크 장비(102)는 3GPP LTE 표준을 이용하고 TDD 모드를 구동하는 EUTRAN(evolved universal terrestrial radio access network)을 포함한다. In one embodiment, the communication network 116 and the network device 102 may include a EUTRAN (evolved universal terrestrial radio access network) to use the 3GPP LTE standard, and drives the TDD mode. 디바이스들(104A, 104B, 104C)은 와이파이 또는 IEEE 802.11 표준 프로토콜, 혹은 3GPP, LTE, 또는 TDD-어드밴스드 또는 이들에 대한 임의의 조합 혹은 다른 통신 표준들과 같은 프로토콜을 이용하도록 구성되는 하나 이상의 안테나, 수신기, 송신기, 또는 트랜시버를 포함할 수 있다. The devices (104A, 104B, 104C) is a Wi-Fi or IEEE 802.11 standard protocol, or 3GPP, LTE, or TDD- advanced or one or more antennas configured to use a protocol, such as any combination or any other communications standard for them, It may include a receiver, transmitter, or transceiver. 디바이스들(104A, 104B, 104C) 내의 안테나 또는 디바이스들(104A, 104B, 104C) 상의 안테나는, 예를 들어 다이폴 안테나, 모노폴 안테나, 패치 안테나, 루프 안테나, 마이크로스트립 안테나 또는 RF 신호 전송에 적합한 다른 형태의 안테나를 포함하는 하나 이상의 지향성 또는 전방향성 안테나를 포함할 수 있다. An antenna on the antenna or the devices in the devices (104A, 104B, 104C) (104A, 104B, 104C) is, for example, dipole antennas, monopole antennas, patch antennas, loop antennas, microstrip antennas or RF signal transmitted other suitable It may include one or more directional or omnidirectional antennas, including the type of antenna. 일부 실시예들에서, 2 이상의 안테나를 대신하여, 다수의 개구를 갖는 단일 안테나가 사용될 수 있다. In some embodiments, in place of the two or more antennas, a single antenna may be used with a plurality of openings. 이들 실시예들에서, 각 개구는 별도의 안테나로 간주될 수 있다. In these embodiments, each aperture may be considered a separate antenna. 일부 MIMO(multiple-input multiple-output) 실시예들에서, 안테나들은 각 안테나와 송신국의 안테나들 사이에서 일어날 수 있는 상이한 채널 특성들 및 공간 다이버시티(spatial diversity)를 이용하도록 유효하게 떨어져 있을 수 있다. In some MIMO (multiple-input multiple-output) embodiment, the antenna can be off enabled to use the different channel characteristics that may occur between the antennas of each antenna and the transmitting station, and spatial diversity (spatial diversity) have. 일부 MIMO 실시예들에서, 안테나들은 파장의 최대 1/10 또는 그 이상으로 떨어져 있을 수 있다. In some MIMO embodiments, the antennas may be off by up to one-tenth or more of the wavelength. 일부 실시예들에서, 모바일 디바이스(104A)는 키보드, 디스플레이, 비휘발성 메모리 포트, 다수의 안테나들, 그래픽 프로세서, 응용 프로세서, 스피커, 및 다른 모바일 디바이스 소자들 중 하나 이상을 포함할 수 있다. In some embodiments, the mobile device (104A) may comprise a keyboard, a display, a nonvolatile memory port, a plurality of antennas, a graphics processor, an application processor, a speaker, and one or more of the other mobile device components. 디스플레이는 터치 스크린을 포함하는 LCD 스크린일 수 있다. The display may be an LCD screen that includes a touch screen. 모바일 디바이스(104B)는 모바일 디바이스(104A)와 유사할 수 있지만, 동일할 필요는 없다. The mobile device (104B), but can be similar to the mobile device (104A), need not be the same. 모바일 디바이스(104C)는 모바일 디바이스(104A)와 관련해서 설명된 특징부들, 구성요소들, 기능 중 일부 또는 전부를 포함할 수 있다. The mobile device (104C) may include any or all of the characteristic portions, components, functions, described in connection with a mobile device (104A). 비록 통신 시스템(100)이 다수의 별도의 기능 소자들을 갖는 것으로 도시되어 있지만, 기능 소자들 중 하나 이상은 결합될 수 있으며, 또한 디지털 신호 프로세서(DSP)를 포함하는 프로세싱 소자들과 같은 소프트웨어-구성된 소자들 및/또한 다른 하드웨어 소자들의 결합에 의해 구현될 수 있다. Although communication system 100 may be seen having a plurality of separate functional elements, one or more of the functional elements may be combined, and software, such as processing elements including digital signal processors (DSP), - consisting of the device and / or may be implemented by a combination of the different hardware components. 예컨대, 일부 소자들은 하나 이상의 마이크로프로세서, DSP, ASIC, 무선 주파수 집적 회로(RFIC) 및 여기서 설명되는 기능들을 적어도 수행하기 위한 다수의 하드웨어 및 논리 회로의 결합을 포함할 수 있다. For example, some components may comprise a combination of a plurality of hardware and logic circuitry for performing at least the functions described one or more microprocessors, DSP, ASIC, a radio frequency integrated circuit (RFIC), and wherein. 일부 실시예들에서, 시스템(100)의 기능 소자들은 하나 이상의 프로세싱 소자들 상에서 동작하는 하나 이상의 프로세서를 지칭할 수 있다. In some embodiments, the functional elements of the system 100 may refer to one or more processors operate on one or more processing elements. 실시예들은 하드웨어, 펌웨어 및 소프트웨어 중 하나 또는 그 조합으로 구현될 수 있다. Embodiments may be implemented in one or a combination of hardware, firmware and software. 또한, 실시예들은 컴퓨터 판독가능 저장 디바이스에 저장된 인스트럭션으로서 구현될 수 있고, 상기 인스트럭션은 여기서 설명되는 동작들을 수행하기 위해 적어도 하나의 프로세서에 의해 판독 및 실행될 수 있다. Furthermore, embodiments may be implemented as instructions stored on a computer-readable storage device, the instructions may be by at least one processor to perform the operations described herein read and executed. 컴퓨터 판독가능 저장 디바이스는 머신(예를 들어, 컴퓨터)에 의해 판독가능한 형태로 정보를 저장하기 위한 비일시적 메카니즘을 포함할 수 있다. Computer program devices machine (e.g., a computer) may include a non-transient mechanism for storing information in a form readable by. 예컨대, 컴퓨터 판독가능 저장 디바이스는 ROM, RAM, 자기 디스크 저장 매체, 광 저장 매체, 플래시 메모리 디바이스, 및 다른 저장 디바이스 및 매체를 포함할 수 있다. For example, the computer readable storage device may include a ROM, RAM, magnetic disk storage media, optical storage media, flash memory devices, and other storage devices and media. 일부 실시예들에서, 시스템(100)은 하나 이상의 프로세서를 포함할 수 있고, 또한 컴퓨터 판독가능 저장 디바이스에 저장된 인스트럭션으로 구성될 수 있다. In some embodiments, the system 100 may include one or more processors, may also be configured with instructions stored in a computer readable storage device. 도 2는 도 1의 통신 네트워크 구조(100)를 이용할 수 있는 예시적인 무선 통신 시스템(200)의 블록도이다. Figure 2 is a block diagram of an exemplary wireless communication system 200 that may utilize a communication network architecture 100 of FIG. 예시적인 통신 시스템(200)은 무선 통신이 가능한 디바이스(202)(예를 들어, 사용자 장치(UE) 또는 통신 스테이션(STA; station))를 포함할 수 있다. Exemplary communication system 200 includes a device 202 capable of wireless communication (e.g., user equipment (UE) or a communication station (STA; station)) may include. 통신 시스템(200)은 무선 통신이 가능한 디바이스(202)를 포함할 수 있다. Communication system 200 may include a device 202 capable of wireless communication. 디바이스(202)는 (예를 들어, 트랜시버의 일부로서) 수신기(218) 및 프로세서(220)를 포함할 수 있다. Device 202 (e. G., As part of the transceiver) to a receiver 218 and a processor 220. 프로세서(220)는 지정된 동작을 수행할 수 있는 임의의 하드웨어, 또는 하드웨어의 서브셋일 수 있다. Processor 220 may be any hardware, or a subset of the hardware to perform the designated operation. 이러한 하드웨어 소자들은 도 6, 7 또는 8과 관련해서 이하에서 열거된다. These hardware devices 6, are exemplified below in relation to the 7 or 8. 프로세서(220)는 포지션 계산기(222)와 통신하도록 배치될 수 있다. Processor 220 may be placed in communication with the position calculator 222. 예에서, 포지션 계산기(222)는 디바이스(202)에 대해 국부적이다(예를 들어, 그 일부임, 그와 통합됨, 그에 속해 있음, 등). In the example, the position calculator 222 is local to the device 202 (e.g., that the part of, integrated with it, belonging thereto, etc.). 예에서, 포지션 계산기(222)는 디바이스(202)로부터 원격이다(예컨대, 떨어져 있음, 네트워크(예를 들어, 206)를 거쳐 간접적으로 액세스 가능함, 상이한 머신(예를 들어, 서버(214)에 있음, 등). 국부적인 경우, 프로세서(220)는 디바이스(202)의 인터링크(예를 들어, 버스, 데이터 포트, 등)를 거쳐 포지션 계산기(222)로의 통신을 수행할 수 있다. 원격인 경우, 프로세서(220)는 네트워크 인터페이스를 거쳐, 예를 들어 네트워크 인터페이스 카드(NIC) 또는 무선 트랜시버를 거쳐 포지션 계산기로의 통신을 수행할 수 있다. In the example, the position calculator 222 is Yes Remote (e. G., Away from the device 202, the network (e.g., a different machine (e.g., indirectly access possible, through 206) example, the server 214 , and so on). If local, processor 220 can communicate to the position calculator 222 via the interlinking (e. g., bus, data port, etc.) of device 202. If it is remote, processor 220 may perform communication by the position calculator via the network interface, for example via a network interface card (NIC) or a wireless transceiver. 예에서, 디바이스(202)는 휴대폰, 스마트폰, 랩탑, 태블릿 컴퓨터, PDA 또는 무선 통신이 가능한 다른 전자 장치와 같은 모바일 컴퓨팅 디바이스일 수 있다. In the example, the device 202 may be a mobile computing device such as a mobile phone, a smart phone, a laptop, tablet computer, PDA or other wireless communication electronic device. 제 1 액세스 포인트(AP)(204)는, 예를 들어 기지국 또는 고정형 무선 라우터일 수 있다. A first access point (AP) (204) may be, for example, a base station or a fixed wireless router. 디바이스(202)는 인터넷과 같은 네트워크(206)에 도달하기 위해 제 1 액세스 포인트(204)와의 통신 링크(212)를 수립할 수 있다. Device 202 may establish a communication link 212 between the first access point 204 to reach the network 206 such as the Internet. 예에서, 디바이스(202)는 임의의 이용가능한 접속 상에서 링크(216)를 통해 액세스 포인트 위치 서버(214)와 통신할 수 있다. In the example, the device 202 may communicate with the access point, the location server 214 via the link 216 on any available connection. 예컨대, 디바이스(202)는 제 1 액세스 포인트(204) 및 네트워크(206)를 통한 링크(216)를 거쳐 액세스 포인트 위치 서버(214)와 통신할 수 있다. For example, device 202 may communicate with the first access point 204 and through the link 216 via the network 206, an access point location, the server (214). 링크(216)는, 예를 들어 디바이스(202)와 액세스 포인트 위치 서버(214) 사이에서 교환되는 데이터의 비승인된 조작 또는 차단을 방지하기 위해 HTTPS(HyperText Transfer Protocol Secured) 및 전송 계층 보안(TLS; transport layer security)을 이용할 수 있다. Link 216, for example, device 202 and the access HTTPS to prevent point location server disapproved operation or block of data to be exchanged between the (214) (HyperText Transfer Protocol Secured) and Transport Layer Security (TLS ; you can use transport layer security). 예에서, 도 1의 네트워크 장비(102)와 같은 셀룰러 기지국은 디바이스(202)와 액세스 포인트 위치 서버(214) 사이에 링크(216)를 제공할 수 있다. In the example, even a cellular base station, such as the network devices 102 1 may provide a link 216 between the device 202 and the access point, the location server 214. 예에서, 제 2 액세스 포인트(208) 또는 제 3 액세스 포인트(210)는 디바이스(202)의 범위 내에 있을 수 있다. In the example, the first access point 208 or third access point 210 may be in the range of the device 202. 디바이스(202)는 제 1 액세스 포인트(204), 제 2 액세스 포인트(208) 또는 제 3 액세스 포인트(210)와 통신할 수 있다. Device 202 may communicate with the first access point 204, second access point 208 or third access point (210). 디바이스(202)는 제 1 액세스 포인트(204), 제 2 액세스 포인트(208), 제 3 액세스 포인트(210), 또는 임의의 다른 액세스 포인트 중 하나 이상에 관한 위치 정보를 액세스 포인트 위치 서버(214)로부터 요청할 수 있다. The device 202 the first access point 204, second access point 208, second access point 210, or position information for an access point location, the server 214 according to one or more of any other access point It may request from. 위치 정보 요청에 응답하여, 액세스 포인트 위치 서버(214)는 요청된 액세스 포인트에 대응하는 위치 정보를 링크(216)를 거쳐 디바이스(202)에게 제공할 수 있다. In response to the location request, the access point location, the server 214 may be via a link 216, the location information corresponding to the requested access points available to the device 202. 예에서, 디바이스(202)는 위치 요청(예를 들어, 컴백 타이밍의 스테이지 I 협상)을 제 1 액세스 포인트(204)를 이용해서 개시할 수 있다. In the example, the device 202 may initiate a location request (e. G., Stage I negotiation comeback timing) by using a first access point (204). 제 1 액세스 포인트(204)는 위치 요청에 응답하여, ToF 측정 교환을 수행하는 데 리소스들을 할당할 수 있다. A first access point 204 may allocate resources for response to a location request, performing the ToF measurements exchange. 도 3은 일부 실시예들에 따라 디바이스의 포지션을 액세스 포인트를 이용해서 결정하는 방법(300)의 동작을 나타내는 스윔-레인 챠트이다. Figure 3 is a swim showing the operation of a method of determining an access point using the position of the device 300 according to some embodiments - is a chart lane. 예컨대, 개시자(302)(예를 들어, 도 2의 디바이스(202)) 및 응답자(304)(예를 들어, 도 2의 제 1 액세스 포인트(204))는 방법(300) 또는 그 일부를 수행하도록 구성될 수 있다. For example, the initiator 302 (e.g., device (202 in FIG. 2)) and the responder 304 (e.g., first access point 204 of FIG. 2) method 300, or portions thereof It can be configured to perform. 방법(300)은 301에서 초반 스테이지 I 협상으로 시작될 수 있다. The method 300 may be initiated in the early stages I negotiated 301. 예에서, 개시자(302)는 응답자(304)와의 통신을 수립하기 위한 요청(306)을 전송할 수 있다. In the example, the initiator 302 may send a request 306 to establish the communication with the responder 304. 응답자(304)는 위치 결정 서비스를 제공하는 능력을 나타내는 확인응답(ACK)(308)으로 응답할 수 있다. Responder 304 may respond with an acknowledgment (ACK) (308) indicating the ability to provide location services. 응답자(304)는 컴백 시간 협상의 부분으로서 M1 메시지(310)를 전송할 수도 있다. Responder 304 may send a message M1 (310) as part of the negotiation time comeback. 개시자(302)는 컴백 시간 협상 및 스테이지 I(301) 협상을 완료하기 위해 ACK(312)를 전송할 수 있다. Initiator 302 may send an ACK (312) to complete the comeback time negotiation and stage I (301) negotiation. 방법(300)은 스테이지 II(313) 사운딩(sounding) 교환으로 계속될 수 있다. The method 300 may continue to stage II (313) sounding (sounding) exchange. 예에서, 개시자(302)는 레인징 요청(ranging request)(314)을 응답자(304)에게 전송할 수 있다. In the example, the initiator 302 may transmit a ranging request (ranging request) (314) to the responder (304). 응답자(304)는 레인징 교환의 수행 가능성을 나타내는 확인응답(ACK)(316)으로 응답할 수 있다. Responder 304 may respond with an acknowledgment (ACK) (316) indicating the possibility of performing a ranging exchange. 318의 시간 T1에서, 응답자(304)는 출발 타이밍 정보, 예를 들어 TOD(M1)를 포함할 수 있는 제 1 메시지 M1(320)을 개시자(302)에게 보낼 수 있다. At time T1 of 318, responder 304 may be sent to the starting timing information, e.g., TOD (M1) a first initiating message M1 (320) characters 302 which may include a. 322의 도착 시간 T2에서, 개시자(302)는 제 1 메시지(320)를 수신하고, 응답으로 ACK(324)를 응답자(304)에게 전송한다. In 322 the arrival time of T2, the initiator 302 sends a first message 320 is received, the ACK responder (324) a response (304) a. ACK(324)는 제 1 메시지(320)의 도착 시간 T2를 나타내는 데이터를 포함할 수 있다. ACK (324) may include data representing the arrival time T2 of the first message (320). 출발 시간 T3(326)에서, 개시자(302)는 제 2 메시지(328)의 출발 시간을 포함할 수 있는 제 2 메시지 M2(328)를 응답자(304)에게 보낸다. In the starting time T3 (326), the initiator 302 sends a second message M2 328, which may include the start time of the second message (328) to the responder (304). 330의 도착 시간 T4에서, 응답자(304)는 개시자(302)로부터 제 2 메시지(328)를 수신하고, 개시자(302)와 응답자(304) 사이의 레인지(a range)를 계산할 수 있다. At 330 the arrival time T4, the responder 304 may be from the initiator (302) to calculate the range (a range) between the second received messages (328), and the initiator 302 and the responder 304. 방법(300)은 보고(reporting) 또는 타임스탬프 폴링 단계를 이용해서 스테이지 III(331)로 계속될 수 있다. The method 300 may continue to stage III (331) using the report (reporting) or time stamps polling step. 예컨대, 개시자(302)는 응답자(304)에 의해 계산된 바와 같이 개시자(302)와 응답자(304) 사이의 레인지를 요청하는 요청(332)을 응답자(304)로 전송할 수 있고, 또는 상기 요청(332)은 추가적인 레인징 교환이 요청된다는 표시(an indication)를 포함할 수 있다. For example, the initiator 302 may send a request 332 to request a range between responder initiator, as calculated by 304 (302) and the responder 304 to the responder (304), or the request 332 may comprise a display (an indication) that the additional ranging exchange is requested. 응답자(304)는 추가적인 레인징 교환을 수행하기 위한 능력 또는 레인지를 나타내는 확인응답(ACK)(334)으로 응답할 수 있다. Responder 304 may respond with an acknowledgment (ACK) (334) indicating the capacity or range for carrying out the additional ranging exchange. 응답자(304)는 다음 컴백 시간 협상의 일부로서 M1 메시지(336)를 전송할 수도 있다. Responder 304 may send a message M1 (336) as part of the negotiation time, and then come back. 개시자(302)는 컴백 시간 협상 및 스테이지 III(331)를 완료하기 위해 ACK(338)를 전송할 수 있다. Initiator 302 may send an ACK (338) to complete the comeback time negotiation and stage III (331). 도 4는 일부 실시예들에 따라 액세스 포인트를 이용해서 디바이스의 포지션을 결정하는 방법(400)의 동작을 나타내는 스윔-레인 챠트이다. 4 is a swim showing the operation of the method of determining the position of a device using the access point, in accordance with some embodiments 400 - a lane chart. 방법(400)은 도 3의 방법(300)의 스테이지 I(301) 및 스테이지 II(313)에서 설명된 요소들로 시작될 수 있다. The method 400 may begin with the elements described in Stage I (301) and stage II (313), the method of Figure 3 (300). 방법(400)은 추가적인 사운딩 교환을 포함하는 보고 또는 타임스탬프 폴링 단계를 이용해서 스테이지 III(401)로 계속될 수 있다. The method 400 is to be continued to the stage III (401) using the report, or time stamp polling step comprising the additional sounding exchange. 예컨대, 개시자(302)는 응답자(304)에 의해 계산된 바와 같이 개시자(302)와 응답자(304) 사이의 레인지를 요청하는 요청(332)을 응답자(304)에게 전송할 수 있다. For example, the initiator 302 may be transmitted to the initiator 302 and the responder 304, responder 304 requests (332) requesting the range between as computed by the responder (304). 요청(332)은 추가적인 레인징 교환이 요청된다는 표시를 포함한다. The request 332 includes an indication that the additional ranging exchange is requested. 응답자(304)는 추가적인 레인징 교환을 수행하기 위한 능력 및 레인지를 나타내는 확인응답(ACK)(334)으로 응답할 수 있다. Responder 304 may respond with an acknowledgment (ACK) (334) that represents the range and capacity to perform the additional ranging exchange. 시간 T1'(402)에서, 응답자(304)는 다음 사운딩 교환의 일부로서 M1 메시지(336)를 전송할 수 있다. At time T1 '(402), responder 304 may send a message M1 (336) as part of the next sounding exchange. 시간 T2'(404)에서, 개시자(302)는 메시지(336)의 출발 시간을 포함하는 메시지(336)를 수신할 수 있다. At time T2 '(404), the initiator 302 may receive the message 336, including the starting time of the message (336). 개시자(302)는 ACK(338)를 응답자(304)에게 전송할 수 있다. Initiator 302 may send an ACK (338) to the responder (304). 시간 T3'(406)에서, 개시자(302)는 제 2 메시지 M2(408)를 응답자(304)에게 전송할 수 있다. At time T3 '(406), the initiator 302 may transmit the second message M2 (408) to the responder (304). 시간 T4'에서 응답자는 제 2 메시지 M2(408)를 수신할 수 있고, 시간 T1', T2', T3' 및 T4'에 기초하여 개시자(302)와 응답자(304) 사이의 레인지를 계산함으로써 스테이지 III(401)를 완료할 수 있다. "Respondents in the second it is possible to receive the message M2 (408), the time T1 'time T4 by calculating the range between, T2', T3 'based on and T4, the initiator 302 and the responder 304 it is possible to complete the stage III (401). 도 3의 방법(300) 및 도 4의 방법(400)과 관련해서 설명된 것과 같이, 정밀 타이밍 측정 프로토콜 교환을 수행하는 데 프레임의 3가지 형태가 이용될 수 있다. As also described with respect to three of the method 300 and method 400 of Figure 4, there are three types of frames to perform a precise timing measurement protocol exchanges it may be used. 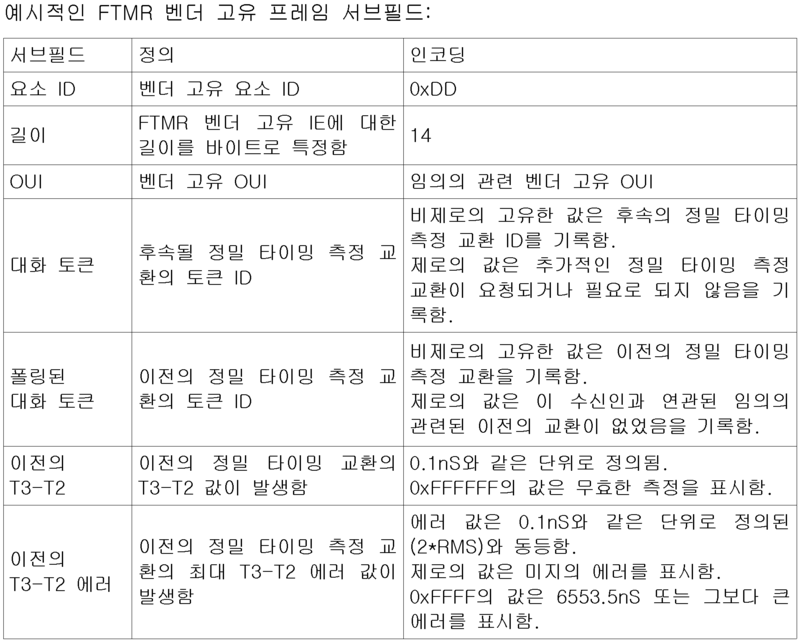 제 1 프레임은 정밀 타이밍 측정 요청(FTMR; fine-timing measurement request)이다. A first frame timing precision measurement request; a (FTMR fine-measurement request timing). FTMR은 도 2의 디바이스(202)와 같은 개시자에 의해 전송될 수 있다. FTMR may also be transmitted by the initiator, such as device 202 of FIG. 후속의 정밀 타이밍 측정 교환 세부사항들의 협상을 개시하고, 이전의 정밀 타이밍 측정 타임스탬프(T3-T2)를 보고하고, 이전의 정밀 타이밍 측정 타임스탬프(T4-T1)를 폴링하는 데 FTMR이 이용될 수 있다. Initiate a follow-up of fine negotiation of timing measurements exchange detail, view before the precision timing measurement time stamp (T3-T2) and FTMR is be used to poll the previous precision timing measurement a time stamp (T4-T1) can. 제 2 프레임은 정밀 타이밍 측정 1(FTM1)이다. The second frame is a precise timing measurement 1 (FTM1). FTM1은 FTMR의 수신에 응답하여 응답자에 의해 전송될 수 있다. FTM1 may be transmitted by the responder in response to receiving the FTMR. FTM1은 이전의 정밀 타이밍 측정 타임스탬프(T4-T1)를 보고하고, 다음 후속의 정밀 타이밍 측정 세부사항들을 보고하고, 정밀 타이밍 측정 교환시에 정밀 타이밍 측정 프레임으로서 동작하는 데 이용될 수 있다. FTM1 may be used to report the transfer of precision timing measurement time stamps (T1-T4), and reports the following precision of the subsequent timing measurements detail, operates as a precision timing measurement frame at the time of precision timing measurement exchange. 제 3 프레임은 정밀 타이밍 측정 2(FTM2)이다. The third frame is a precise timing measurement 2 (FTM2). FTM2는 정밀 타이밍 측정 교환시에 개시자에 의해 전송될 수 있고, 정밀 타이밍 측정 프레임으로서 동작한다. FTM2 may be transmitted by the initiator at the time of precision timing measurement exchange, and operates as a precision timing measurement frame. 정밀 타이밍 측정 요청(FTMR)은 IEEE draft P802.11 REVmc_D.1.2 - Section 8.6.8.25에서 논의된 바와 같은 FTMR 프레임 구조에 기초할 수 있다. Precision timing measurement request (FTMR) is IEEE draft P802.11 REVmc_D.1.2 - may be based on FTMR frame structure as discussed in Section 8.6.8.25. 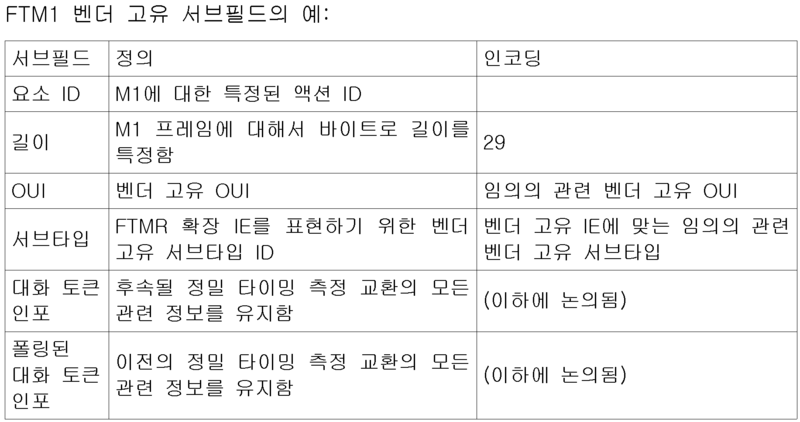 E2E 프로토콜에 있어서 추가된 필드를 완료시키기 위해 벤더 고유(vendor specific) IE에 부가하여, FTMR은 확인응답(ACK)을 이용하는 퍼블릭 액션 프레임(a public action frame)이다. In order to complete the field is added in the E2E protocol added to the vendor-specific IE (vendor specific), FTMR is a public action frame (a public action frame) using an acknowledgment (ACK). 정밀 타이밍 측정 1(FTM1)은, E2E 프로토콜에 있어서 추가된 필드를 완료시키기 위해 벤더 고유 IE에 부가하여, IEEE P802.11REVmc_D.1.2 - Section 8.6.8.26과 같은 IEEE 드래프트 표준에 기초할 수 있다. Precision timing measurement 1 (FTM1) is, in addition to the vendor-specific IE in order to complete an additional field in the E2E protocol, IEEE P802.11REVmc_D.1.2 - may be based on the IEEE draft standard, such as Section 8.6.8.26. FTM1은 확인응답(ACK)을 이용하는 퍼블릭 액션 프레임을 포함할 수 있다. FTM1 may include a public action frame using an acknowledgment (ACK). FTM1은 다음의 3개의 레이트: 수신인의 지원되는 채널 폭을 초과하지 않는 20Mhz, 40Mhz, 또는 80Mhz의 대역폭(BW); FTM1 is three rates of the following: a 20Mhz does not exceed the width of the supported channels of the recipient, 40Mhz, 80Mhz or bandwidth (BW); MCS/Rate: HT0 또는 비-HT 레이트 6Mbps 듀플리케이트; MCS / Rate: HT0 or non -HT rate 6Mbps duplicated; 또는 수신인의 지원되는 MCS se를 초과하지 않는 SISO/MIMO 중 하나의 공간 스트림(spatial streams) 중 하나로 전송될 수 있다. Or it does not exceed the support MCS se that the recipient may be sent to one of the SISO / MIMO spatial stream during a single (spatial streams). FTM1은 FTM1 + Sifs + Ack + Sifs + M2를 고려하는 지속기간(duration) 필드를 설정할 수 있다. FTM1 may set a duration (duration) field to consider FTM1 Sifs + + Ack + Sifs + M2. 정밀 타이밍 측정 2(FTM2)는 IEEE P802. Precision timing measurement 2 (FTM2) is IEEE P802. 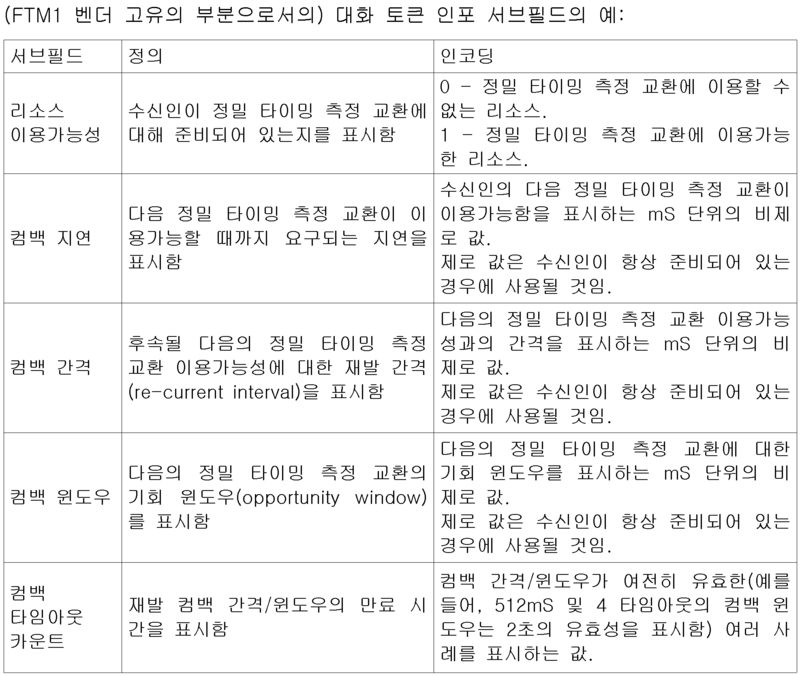 ll REVmc_D.1.2 - Section 8.6.8.26와 같은 IEEE 드래프트 사양에 기초할 수 있다. ll REVmc_D.1.2 - may be based on the IEEE draft specification, such as Section 8.6.8.26. FTM2는 No-Ack 정책을 갖는 퍼블릭 액션 프레임을 포함할 수 있다. FTM2 may include a public action frame having a No-Ack policy. FTM2는 FTM1과 동일한 BW, MCR/Rate, 및 공간 스트림으로 전송될 수 있다. FTM2 may be sent to the same BW, MCR / Rate, and spatial stream and FTM1. 이하의 테이블은 손실된 또는 기형의 패킷 도착시에 예시적인 재시도 정책 및 예상된 에러 처리를 기재한다. The following table is illustrative of retries based policies and the expected error processing at the time of arrival of the packet loss or deformity. 도 5는 일부 실시예들에 따라 디바이스의 포지션을 결정하는 예시적인 방법(500)을 나타내는 흐름도이다. 5 is a flow chart illustrating an exemplary method for determining a position of a device 500 in accordance with some embodiments. 예에서, 방법(500)은 도 2의 액세스 포인트(204)와 같은 응답자와 레인징 교환을 수행하는 시도에서, 도 2의 디바이스(202)와 같은 개시자에 의해 수행될 수 있다. In the example, the method 500 may be performed by an initiator, such as in an attempt to also do the respondents and ranging exchange, such as access point 204 in the second, and the device 202 of FIG. 레인징 교환은 정밀 타이밍 측정(FTM)을 수행하는 TOF 프로토콜을 포함할 수 있다. Ranging exchange may include a TOF protocol for performing precision timing measurement (FTM). 개시자가 무선 네트워크에 이미 접속되어 있지 않으면, 방법(500)은 이용가능한 무선 네트워크를 발견하기 위한 개시자 시도로 시작될 수 있다. If the initiator is not already connected to a wireless network, the method 500 may be initiated by the initiator attempts to find an available wireless network. 무선 네트워크는 와이파이 또는 IEEE 802.11 표준 프로토콜, 혹은 현존의 3GPP, LET, 또는 TDD-어드밴스드와 같은 프로토콜을 이용할 수 있다. The wireless network may use a protocol such as Wi-Fi, or IEEE 802.11 standard protocol, or the presence of the 3GPP, LET, or TDD- advanced. 502에서, 디바이스는 응답자에 의한 TOF 프로토콜 요청을 개시할 수 있다. At 502, the device may initiate a TOF protocol request by the responder. 504에서, 개시자는 다음 FTM 교환을 위한 컴백 타이밍을 응답자와 협상할 수 있다. At 504, it can start to negotiate the comeback timing for the next exchange and FTM responder. 506에서, 개시자는 응답자와의 정밀 타이밍 측정 교환을 수행할 수 있다. At 506, The disclosure can perform precise timing measurements exchange with the responder. 예에서, 응답자로부터 개시자에 의해 수신된 TOF 패킷은 응답자에서의 요청 도착 시간, 및 응답자에 의한 요청에 대한 응답 전송에 따른 응답 시간을 표시하는 데이터를 포함할 수 있다. In the example, that is received by the initiator from the responder TOF packet may contain data indicative of the response time of the response to the request transmitted by the request from the responder arrival time, and the Responder. 508에서, 개시자는 다음의 정밀 타이밍 측정 교환을 위한 컴백 타이밍을 선택적으로 협상할 수 있다. At 508, The disclosure may selectively negotiate the comeback timing for the next measurement precision timing of the exchange. 510에서, 개시자는 응답자로부터 하나 이상의 패킷을 수신할 수 있다. At 510, The disclosure may receive one or more packets from the responder. 하나 이상의 패킷은 응답자에 의해 결정된 바와 같은 요청 시간 및 응답 시간을 표시하는 타이밍 데이터를 포함할 수 있다. One or more packets may include a timing data indicating a request time and response time, as determined by the responder. 예에서, 개시자 또는 응답자는 개시자와 응답자 간의 교환에 기초한 차분 계산(differential computation)을 수행하여 개시자와 응답자 간의 거리를 결정할 수 있다. In the example, the initiator or responder may be by performing a differential calculation (differential computation) based on the exchange between the initiator and the responder to determine the distance between the initiator and the responder. 512에서, 개시자는 응답자와의 추가적인 정밀 타이밍 측정 교환을 선택적으로 수행할 수 있다. At 512, The disclosure can be optionally performed to further precisely measure the timing of the exchange and the responder. 514에서, 개시자 또는 응답자는 개시자의 위치를 결정할 수 있다. In 514, the initiator or the responder is possible to determine the position of the initiator. 예에서, 위치는 절대적인 지리적 위치일 수 있다. In the example, the location may be an absolute geographical position. 예에서, 응답자는 지리적 위도 및 경도를 포함하는 데이터 구조 등의 응답자의 지리적 위치들을 제공할 수 있다. In the example, the responder may provide the geographic position of the responder, such as a data structure including a geographic latitude and longitude. 예에서, 위치는 응답자에 대한 상대적인 위치일 수 있다. In the example, the position may be a relative position with respect to the responder. 또한, 방법(500)의 이들 동작들은 디바이스(202), 액세스 포인트(204, 208, 210), 또는 도 2의 디바이스(202)와 통신하는 프로세서들의 조합에 의해 수행될 수 있다. In addition, these operations of the method 500 may be performed by a combination of the device 202, the access point (204, 208, 210), or a processor in communication with the device 202 of FIG. 선택적으로, 방법(500)은, IEEE 802.11 표준(예를 들어, 소프트웨어 액세스 포인트들(Soft APs)에 의해 가능하게 되는 와이파이 다이렉트 통신), 3GPP LTE/LTE-A 통신(예를 들어, 업링크 세그먼트 또는 다른 지정된 리소스들 중 일부에서 수립된 LTE 다이렉트(LTE-D) 통신), IEEE 802.16 표준과 관련하여 수행되는 머신-투-머신(M2M) 통신 등을 포함한, 허가 또는 비허가 스펙트럼 대역들에서의 다양한 네트워크 프로토콜들 및 표준들 중 임의의 것에 의해 정의되는 하나 이상의 동작들을 포함할 수 있다. Alternatively, the method 500, IEEE 802.11 standards (e.g., software access points (Wi-Fi Direct communication is made possible by the Soft APs)), 3GPP LTE / LTE-A communication (e.g., uplink segment in the machine (including the M2M) communication, permission or unlicensed spectrum band or the LTE direct (LTE-D) communications), a machine is performed with respect to the IEEE 802.16 standard established in some of the other specified resource-to of the various network protocols and standards may include one or more operations that are defined by any. 도 5의 예에서는 연속적으로 배치되어 있지만, 다른 예들은 동작들을 재순서화하고, 하나 이상의 동작들을 생략하고, 및/또는 2 이상의 가상 머신 또는 서브 프로세서로 구성된 단일 프로세서 또는 다중 프로세서를 이용해서 동시에 2 이상의 동작을 실행할 수 있다. In FIG. 5 for example, but are arranged continuously, Other examples using a single-processor or multi-processor ordering re-operations, and configured to omit one or more operations, and / or two or more virtual machines or sub-processors at the same time two or more You can run the operation. 게다가, 또 다른 예들은 집적 회로 모듈들 사이에서 또한 모듈들을 통해 통신되는 관련 제어 및 데이터 신호들을 갖고서 집적 회로 모듈들 또는 하나 이상의 특정 상호연결 하드웨어로서 동작들을 구현할 수 있다. In addition, another example may gatgoseo related control and data signals, which also communicate through module between the integrated circuit modules implement the integrated circuit modules, or one or more of the operations as the specific interconnection hardware. 따라서, 임의의 프로세스 흐름은 소프트웨어, 펌웨어, 하드웨어, 및 하이브리드 구현에 적용가능하다. Thus, any process flow is applicable to software, firmware, hardware, and hybrid implementations. 도 6은 일부 실시예들에 따른 UE(600)의 기능 블록도를 도시한다. Figure 6 shows a functional block diagram of a UE (600) in accordance with some embodiments. UE(600)는 디바이스(112)(도 1) 또는 디바이스(202)(도 2)로서의 사용에 적합할 수 있다. UE (600) may be suitable for use as the device 112 (FIG. 1) or device 202 (Fig. 2). UE(600)는 하나 이상의 안테나(601)를 이용해서 eNB들로부터 신호를 수신하고 eNB들로 신호를 전송하는 물리적 계층 회로(602)를 포함할 수 있다. UE (600) may receive signals from the eNB using the at least one antenna 601 includes a physical layer circuit 602 which sends signals to the eNB. 또한, UE(600)는 다른 것들 중에서도 채널 추정기를 포함할 수 있는 프로세싱 회로(606)를 포함할 수 있다. In addition, UE (600) is, among other things can include a processing circuit 606 that may include a channel estimator. UE(600)는 또한 메모리(608)을 포함할 수 있다. UE (600) it may also include a memory 608. 프로세싱 회로는 이하에서 논의되는 다수의 상이한 피드백 값들을 eNB로의 전송을 위해 결정하도록 구성될 수 있다. The processing circuit may be configured a number of different feedback value discussed below to determine for transmission to the eNB. 프로세싱 회로는 또한 매체 액세스 제어(MAC) 계층(604)을 포함할 수 있다. The processing circuitry may also include a medium access control (MAC) layer 604. 일부 실시예들에서, UE(600)는 키보드, 디스플레이, 비휘발성 메모리 포트, 다수의 안테나, 그래픽 프로세서, 응용 프로세서, 스피커, 및 다른 모바일 디바이스 소자들 중 하나 이상을 포함할 수 있다. In some embodiments, UE (600) may include a keyboard, display, a non-volatile memory port, a plurality of antennas, a graphics processor, an application processor, a speaker, and one or more of the other mobile device components. 디스플레이는 터치스크린을 포함하는 LCD 스크린일 수 있다. The display may be an LCD screen that includes a touch screen. UE(600)에 의해 이용되는 하나 이상의 안테나(601)는, 예를 들어 다이폴 안테나, 모노폴 안테나, 패치 안테나, 루프 안테나, 마이크로스트립 안테나 또는 RF 신호의 전송에 적합한 다른 형태의 안테나를 포함하는 하나 이상의 지향성 또는 전방향성 안테나를 포함할 수 있다. One or more antennas 601 used by the UE (600) is, for example, dipole antennas, monopole antennas, patch antennas, loop antennas, microstrip antennas or transmit more than one containing a different type of antenna suitable for RF signal directional or former may include a directional antenna. 일부 실시예들에서, 2 이상의 안테나 대신에, 다수의 개구를 갖는 단일 안테나가 사용될 수 있다. In some embodiments, instead of two or more antennas, a single antenna may be used with a plurality of openings. 이들 실시예들에서, 각 개구는 별도의 안테나로 간주될 수 있다. In these embodiments, each aperture may be considered a separate antenna. 일부 MIMO 실시예들에서, 안테나들은 각 안테나와 송신국의 안테나들 사이에서 일어날 수 있는 상이한 채널 특성들 및 공간 다이버시티를 이용하도록 효과적으로 떨어져 있을 수 있다. In some MIMO embodiments, the antennas may be effectively off to use a different channel characteristics and spatial diversity which can occur between the antenna and the antenna of each transmitting station. 일부 MIMO 실시예들에서, 안테나들은 파장의 최대 1/10 또는 그 이상으로 떨어져 있을 수 있다. In some MIMO embodiments, the antennas may be off by up to one-tenth or more of the wavelength. UE(600)가 다수의 별도의 기능 소자들을 갖는 것으로 도시되어 있지만, 기능 소자들 중 하나 이상은 결합될 수 있거나, 혹은 DSP를 포함하는 프로세싱 소자들과 같은 소프트웨어-구성된 소자들, 및/또는 다른 하드웨어 소자들의 결합에 의해 구현될 수 있다. UE (600) a plurality of separate functions, but is shown with the elements, features, one or more of the elements may be combined, or software, such as the processing device including a DSP - the device is configured, and / or other It can be implemented by a combination of hardware components. 예컨대, 일부 소자들은 하나 이상의 마이크로프로세서, DSP, ASIC, 무선 주파수 집적 회로(RFIC) 및 여기서 설명되는 기능들을 적어도 수행하기 위한 다수의 하드웨어 및 논리 회로의 결합을 포함할 수 있다. For example, some components may comprise a combination of a plurality of hardware and logic circuitry for performing at least the functions described one or more microprocessors, DSP, ASIC, a radio frequency integrated circuit (RFIC), and wherein. 일부 실시예들에서, 시스템(100)의 기능 소자들은 하나 이상의 프로세싱 소자들 상에서 동작하는 하나 이상의 프로세서를 지칭할 수 있다. In some embodiments, the functional elements of the system 100 may refer to one or more processors operate on one or more processing elements. 실시예들은 하드웨어, 펌웨어 및 소프트웨어 중 하나 또는 그 조합으로 구현될 수 있다. Embodiments may be implemented in one or a combination of hardware, firmware and software. 또한, 실시예들은 컴퓨터 판독가능 저장 디바이스에 저장된 인스트럭션으로서 구현될 수 있고, 상기 인스트럭션은 여기서 설명되는 동작들을 수행하기 위해 적어도 하나의 프로세서에 의해 판독 및 실행될 수 있다. Furthermore, embodiments may be implemented as instructions stored on a computer-readable storage device, the instructions may be by at least one processor to perform the operations described herein read and executed. 컴퓨터 판독가능 저장 디바이스는 머신(예를 들어, 컴퓨터)에 의해 판독가능한 형태로 정보를 저장하기 위한 비일시적 메카니즘을 포함할 수 있다. Computer program devices machine (e.g., a computer) may include a non-transient mechanism for storing information in a form readable by. 예컨대, 컴퓨터 판독가능 저장 디바이스는 ROM, RAM, 자기 디스크 저장 매체, 광 저장 매체, 플래시 메모리 디바이스, 및 다른 저장 디바이스 및 매체를 포함할 수 있다. For example, the computer readable storage device may include a ROM, RAM, magnetic disk storage media, optical storage media, flash memory devices, and other storage devices and media. 일부 실시예들에서, UE(600)의 하나 이상의 프로세서들은 여기서 설명되는 동작들을 수행하기 위한 인스트럭션으로 구성될 수 있다. In some embodiments, the one or more processors of the UE (600) may be configured with instructions for performing the operations described herein. 일부 실시예들에서, UE(600)는 OFDMA 통신 기술에 따라 다중 캐리어 통신 채널 상에서 직교 주파수-분할 다중화(OFDM) 통신 신호를 수신하도록 구성될 수 있다. In some embodiments, UE (600) is an orthogonal frequency multi-carrier on the communication channel in accordance with OFDMA communication technologies can be configured to receive a division multiplexed (OFDM) communication signals. OFDM 신호는 복수의 직교 서브 캐리어를 포함할 수 있다. OFDM signals may comprise a plurality of orthogonal subcarriers. 일부의 광대역 다중 캐리어 실시예들에서, (매크로 eNB 및 피코 eNB들을 포함하는) eNB들은 WiMAX(Worldwide Interoperability for Microwave Access) 통신 네트워크 또는 3GPP(3rd Generation Partnership Project) UTRAN(Universal Terrestrial Radio Access Network) LTE(Long-Term-Evolution) 또는 LTE 통신 네트워크와 같은 광대역 무선 액세스(BWA) 네트워크 통신 네트워크의 일부일 수 있지만, 여기서 설명되는 본 발명의 청구대상의 범위는 이러한 측면에 한정되지 않는다. In embodiments, some of the wideband multi-carrier such as (macro eNB and including a pico eNB) eNB are (Worldwide Interoperability for Microwave Access) communication network or a 3GPP (3rd Generation Partnership Project) (Universal Terrestrial Radio Access Network) UTRAN WiMAX LTE ( Long-Term-Evolution) or may be part of a broadband wireless access (BWA) network communication networks, such as LTE communication network, the scope of the claimed subject matter of the invention described herein is not limited to this aspect. 이들 광대역 다중 캐리어 실시예들에서, UE(600) 및 eNB들은 OFDMA 기술에 따라 통신하도록 구성될 수 있다. In these broadband multi-carrier embodiments, UE (600) and eNB may be configured to communicate in accordance with OFDMA techniques. UTRAN LTE 표준은 그 변형 및 진화를 포함한 UTRAN-LTE에 대한 3GPP 표준인 2008년 3월의 릴리즈 8 및 2010년 12월의 릴리즈 10을 포함한다. The UTRAN LTE standards, including 3GPP Release 10 standard release 8 March 2008 and December 2010 for UTRAN-LTE, including its transformation and evolution. 일부 LTE 실시예들에서, 무선 리소스의 기본 유닛은 PRB(Physical Resource Block)이다. In some LTE embodiment, the main unit PRB (Physical Resource Block) of the radio resource. PRB는 주파수 도메인에서의 12 서브 캐리어들 x 시간 도메인에서의 0.5ms를 포함할 수 있다. PRB may comprise 12 subcarriers x 0.5ms in the time domain in the frequency domain. PRB들은 (시간 도메인에서) 쌍으로 할당될 수 있다. PRB may be assigned in pairs (in the time domain). 이들 실시예들에서, PRB는 복수의 리소스 소자(RE)를 포함할 수 있다. In these embodiments, PRB may comprise a plurality of resource elements (RE). RE는 하나의 서브 캐리어 x 하나의 심볼을 포함할 수 있다. RE may include one symbol of a subcarrier x. 2가지 형태의 참조 신호들 복조 참조 신호(DM-RS; demodulation reference signals), 채널 상태 정보 참조 신호(CIS-RS; channel state information reference signals) 및/또는 공통 참조 신호(CRS; common reference signal)를 포함해서 eNB에 의해 전송될 수 있다. Two types of reference signals, reference demodulated signal; (common reference signal CRS) (DM-RS;; demodulation reference signals), channel reference state information signal (CIS-RS channel state information reference signals) and / or a common reference signal It has to be sent by the eNB included. DM-RS는 데이터 복조를 위해 UE에 의해 사용될 수 있다. DM-RS may be used by the UE for data demodulation. 참조 신호들은 사전 결정된 PRB들에서 전송될 수 있다. Reference signals may be sent in the predetermined PRB. 일부 실시예들에서, OFDMA 기술은 상이한 업링크 및 다운링크 스펙트럼을 사용하는 주파수 도메인 듀플렉싱(FDD; frequency domain duplexing) 기술, 또는 업링크 및 다운링크를 위해 동일한 스펙트럼을 사용하는 시간-도메인 듀플렉싱(TDD; time-domain duplexing) 기술일 수 있다. In some embodiments, OFDMA technique is different from the uplink and downlink duplexing frequency domain duplexing to use the spectrum (FDD; frequency domain duplexing) technology, or uplink, and time using the same spectrum for downlink-domain duplexing may be; (TDD time-domain duplexing) technology. 일부 다른 실시예들에서, UE(600) 및 eNB들은 확산 스펙트럼 변조(예를 들어, DS-CDMA(direct sequence code division multiple access) 및/또는 FH-CDMA(frequency hopping code division multiple access)), TDM(time-division multiplexing) 변조, 및/또는 FDM(frequency-division multiplexing) 변조와 같은 하나 이상의 다른 변조 기술을 이용해서 전송된 신호를 통신하도록 구성될 수 있지만, 실시예들의 범위는 이러한 측면으로 제한되지 않는다. Some other embodiments, UE (600) and the eNB are spread-spectrum modulation (e.g., DS-CDMA (direct sequence code division multiple access) and / or FH-CDMA (frequency hopping code division multiple access)), TDM (time-division multiplexing) modulation, and / or FDM (frequency-division multiplexing), but the modulation and can be configured to communicate a signal transmitted using at least one other modulation techniques, such as, the scope of the embodiments is not limited in this respect, no. 일부 실시예들에서, UE(600)는 PDA, 무선 통신 능력을 갖는 랩탑 또는 휴대용 컴퓨터, 웹 태블릿, 무선 전화, 무선 헤드셋, 페이저, 인스턴트 메시징 디바이스, 디지털 카메라, 액세스 포인트, 텔레비전, 의료 장치(예를 들어, 심박수 모니터, 혈압 모니터, 등), 또는 정보를 무선으로 수신 및/또는 전송할 수 있는 다른 디바이스와 같은 휴대용 무선 통신 디바이스의 부분일 수 있다. In some embodiments, UE (600) is a PDA, a wireless communication having an ability laptop or portable computer, a web tablet, a wireless telephone, a wireless headset, a pager, an instant messaging device, a digital camera, an access point, a television, a medical device (such as for example, a heart rate monitor, can be a part of a portable radio communication device, such as a blood pressure monitor, etc. ), or information with other devices that may receive and / or transmit over the air. 일부 실시예들에서, UE(600)는 폐루프 공간 다중화 전송 모드(closed-loop spatial multiplexing transmission mode)에 대한 채널 적응을 수행하는 데 사용될 수 있는 다수의 상이한 피드백 값들을 계산할 수 있다. In some embodiments, UE (600) may calculate a number of different feedback value that may be used to perform a channel adapted for the closed-loop spatial multiplexing transmission mode (closed-loop spatial multiplexing transmission mode). 이들 피드백 값들은 채널 품질 표시자(CQI; channel-quality indicator), 등급 표시자(RI; rank indicator) 및 프리코딩 매트릭스 표시자(PMI; precoding matrix indicator)를 포함할 수 있다. These values ​​are feedback channel quality indicators may include; (PMI precoding matrix indicator) (CQI;; channel-quality indicator), rating indicator (RI rank indicator) and precoding matrix indicator. CQI에 의해, 송신기는 다수의 변조 알파벳들 및 코드 레이트 조합들 중 하나를 선택한다. By the CQI, the transmitter selects one of the plurality of modulation alphabet and code rate combinations. RI는 현재의 MIMO 채널에 대한 유용한 전송 계층들의 수를 송신기에게 알려주고, PMI는 송신기에서 적용되는 (송신 안테나의 개수에 따라) 프리코딩 매트릭스의 코드북 인덱스를 표시한다. RI is informed of the number of useful transmission layers for the current MIMO channel to the transmitter, PMI denotes the codebook index of a precoding matrix (according to the number of transmit antennas) are applied at the transmitter. eNB에 의해 사용되는 코드 레이트는 CQI에 기초할 수 있다. Code rate used by the eNB may be based on the CQI. PMI는 UE에 의해 계산되어 eNB에 보고되는 벡터일 수 있다. PMI is calculated by the UE may be a vector which is reported to the eNB. 일부 실시예들에서, UE는 CQI/PMI 또는 RI를 포함한 포맷 2, 2a 또는 2b의 물리적 업링크 제어 채널(PUCCH; physical uplink control channel)을 전송할 수 있다. In some embodiments, UE is the physical uplink control channel format 2, 2a or 2b, including a CQI / PMI or RI; may send a (PUCCH physical uplink control channel). 이들 실시예들에서, CQI는 UE(600)에 의해 경험되는 다운링크 모바일 무선 채널 품질의 표시일 수 있다. In these embodiments, CQI may be an indication of a downlink mobile radio channel quality experienced by the UE (600). CQI는 UE(600)로 하여금 주어진 무선 링크 품질을 위해 사용하기에 최적의 변조 방식 및 코딩 레이트를 eNB에게 제안할 수 있도록 하여, 결과적인 전송 블록 에러 레이트가 10%와 같은 소정의 값을 초과하지 않을 것이다. The CQI and to offer to eNB the optimal modulation scheme and coding rate to allow the UE (600) to use for a given radio link quality, the resulting transport block error rate is not greater than a predetermined value, such as 10% will not. 일부 실시예들에서, UE는 시스템 대역폭의 채널 품질을 가리키는 광대역 CQI 값을 보고할 수 있다. In some embodiments, UE may report a wideband CQI indicating the channel quality values ​​of the system bandwidth. UE는 또한 상위 계층에 의해 구성될 수 있는 소정수의 리소스 블록들의 서브-대역마다 서브-대역 CQI 값을 보고할 수 있다. The UE also sub-blocks of the predetermined number of resources that can be configured by a higher layer - can be reported in-band CQI values ​​for each sub-band. 서브-대역들의 전체 세트는 시스템 대역폭을 커버할 수 있다. A sub-set of the entire band can cover the system bandwidth. 공간 다중화의 경우에, 코드 워드마다 CQI가 보고될 수 있다. In the case of spatial multiplexing, the CQI can be reported for each code word. 일부 실시예들에서, PMI는 주어진 무선 조건에 있어서 eNB에 의해 사용되는 최적의 프리코딩 매트릭스를 표시할 수 있다. In some embodiments, PMI may indicate an optimum precoding matrix to be used by the eNB for a given radio condition. PMI 값은 코드북 테이블을 가리킨다. PMI value refers to the codebook table. 네트워크는 PMI 보고에 의해 표현되는 리소스 블록들의 수를 구성한다. Network may configure the number of resource blocks expressed by the PMI report. 일부 실시예들에서, 시스템 대역폭을 커버하기 위해, 다수의 PMI 보고들이 제공될 수 있다. In some embodiments, in order to cover the system bandwidth, the number of PMI report may be provided. PMI 보고들은 또한 폐루프 공간 다중화, 다중-사용자 MIMO 및 폐루프 랭크 1 프리코딩 MIMO 모드를 위해 제공될 수 있다. PMI report are also closed-loop spatial multiplexing, a multi-can be provided to the user MIMO and closed-loop rank 1 precoding MIMO mode. 일부 CoMP(cooperating multipoint) 실시예들에서, 네트워크는 원격-무선 헤드들(RRHs; remote-radio heads)과 같은 2 이상의 협조/조정 포인트들(cooperating/coordinating points)이 공동으로 전송하는 UE로의 협력 전송(joint transmissions)을 위해 구성될 수 있다. In embodiments, some CoMP (cooperating multipoint), the network is a remote-radio heads (RRHs; remote-radio heads) and two or more cooperative / adjust such points (cooperating / coordinating points) the collaborative transmission to the UE which transmitted the It may be configured to (joint transmissions). 이들 실시예들에서, 협력 전송은 MIMO 전송일 수 있고, 협조 포인트들은 협력 빔형성(joint beamforming)을 수행하도록 구성된다. In these embodiments, cooperative transmission may be a MIMO transmission, coordination points are configured to perform the cooperative beamforming (joint beamforming). 도 7은 여기서 논의되는 기술들(예를 들어, 방법론들) 중 임의의 하나 이상의 것이 수행될 수 있는 모바일 디바이스(700)를 도시하는 블록도이다. Figure 7 is a block diagram illustrating a mobile device 700 that may be performed to any one or more of the techniques discussed herein (e.g., the methods). 모바일 디바이스(700)는 프로세서(710)를 포함할 수 있다. Mobile device 700 may include a processor 710. 프로세서(710)는 모바일 디바이스들에 적합한 다수의 상이한 형태의 상업적으로 이용가능한 프로세서들, 예를 들어 엑스스케일(XScale) 아키텍처 프로세서, MIPS(Microprocessor without Interlocked Pipeline Stages) 아키텍처 프로세서, 또는 다른 형태의 프로세서 중 임의의 것일 수 있다. Processor 710 of a number of different commercially available processors in the form of, for example, XScale (XScale) architecture processor, a MIPS (Microprocessor without Interlocked Pipeline Stages) architecture processor, or other type of processors for mobile devices It may be any. RAM, 플래시 메모리, 또는 다른 형태의 메모리와 같은 메모리(720)는 일반적으로 프로세서(710)에 액세스가능하다. Memory 720 such as RAM, flash memory, or other type of memory is generally accessible to the processor 710. 메모리(720)는 오퍼레이팅 시스템(OS)(730)뿐만 아니라 애플리케이션 프로그램(740)을 저장하도록 구성될 수 있다. Memory 720 may be configured, as well as an operating system (OS) (730) to store an application program 740. OS(730) 또는 응용 프로그램(740)은 여기서 논의된 기술들 중 임의의 하나 이상의 기술을 모바일 디바이스(700)의 프로세서(710)가 수행하게 할 수 있는 컴퓨터 판독가능 매체(예를 들어, 메모리(720))에 저장된 인스트럭션을 포함할 수 있다. OS (730) or the application 740 is described in one example, a computer-readable medium (for example, with processor 710 to perform the mobile device 700 to any one or more techniques discussed herein, a memory ( 720)) may include stored instructions. 프로세서(710)는 디스플레이(750) 및 키패드, 터치 패널 센서, 마이크로폰 등과 같은 하나 이상의 입/출력(I/O) 디바이스(760)에 직접적으로 또는 적절한 중간 하드웨어(intermediary hardware)를 거쳐서 연결될 수 있다. Processor 710 may be coupled via the display 750 and a keypad, a touch panel sensor, either directly or appropriate intermediate hardware (intermediary hardware) to one or more input / output (I / O) devices 760 such as a microphone. 마찬가지로, 실시예에서, 프로세서(710)는 안테나(790)와 인터페이싱하는 트랜시버(770)에 연결될 수 있다. Similarly, in an embodiment, processor 710 may be coupled to transceiver 770, which interfaces with the antenna (790). 트랜시버(770)는 모바일 디바이스(700)의 성질에 따라 셀룰러 네트워크 신호, 무선 데이터 신호, 또는 다른 형태의 신호를 안테나(790)를 거쳐 전송 및 수신하도록 구성될 수 있다. Transceiver 770 may be configured to transmit and receive through the antenna 790, a cellular network signal, the radio data signal, or other types of signals depending on the nature of the mobile device 700. 또한, 일부 구성들에서, GPS 수신기(780)는 또한 GPS 신호를 수신하기 위해 안테나(790)를 이용할 수 있다. Also, in some configurations, GPS receiver 780 may also use the antenna 790 to receive GPS signals. 도 8은 여기서 논의되는 기술들(예를 들어, 방법론들) 중 임의의 하나 이상의 기술이 수행될 수 있는 예시적인 머신(800)의 블록도를 도시한다. Figure 8 wherein the techniques discussed (e. G., Methodology) of a block diagram of an exemplary machine 800 that is any one or more of the techniques may be carried out. 대안의 실시예들에서, 머신(800)은 스탠드얼론 디바이스(a standalone device)로서 동작할 수 있거나 혹은 다른 머신들에 연결(예를 들어, 네트워크화)될 수 있다. In an alternate embodiment, the machine 800 or can operate as a standalone device (a standalone device), or coupled to the other machine may be (e.g., networked). 네트워크화된 배치에서, 머신(800)은 서버 머신으로, 클라이언트 머신으로, 또는 서버-클라이언트 네트워크 환경에서는 양쪽으로 동작할 수 있다. In a networked deployment, the machine 800 includes a server machine, the client machine, or server, the client network environment may operate in either direction. 예에서, 머신(800)은 피어-투-피어(P2P)(또는 다른 분산형) 네트워크 환경에서 피어 머신으로서 기능할 수 있다. In the example, the machine 800 includes a peer-to-peer may serve as a machine in a peer (P2P) (or other distributed) network environment. 머신(800)은 PC, 태블릿 PC, PDA, 휴대전화, 웹 어플라이언스, 또는 임의의 머신에 의해 취해져야 하는 동작들을 특정하는 인스트럭션을 (순차적으로 또는 그와 달리) 실행할 수 있는 임의의 머신일 수 있다. Machine 800 may be any machine capable of executing PC, tablet PC, PDA, mobile telephone, a Web appliance, or instructions for (or in contrast to the sequence) for identifying the operation to be taken by any of the machine . 또한, 단일 머신만이 도시되어 있지만, "머신"이란 용어는 또한 클라우딩 컴퓨팅, SaaS(software as a service), 다른 컴퓨터 클러스터 구성들과 같은 여기서 논의되는 방법론들 중 임의의 하나 이상의 방법론을 수행하기 위한 인스트럭션들의 세트(또는 다수의 세트)를 개별적으로 또는 공동으로 실행하는 머신들의 임의의 집합을 포함하도록 취해져야 한다. In addition, but only a single machine is illustrated, the "machine" refers to the addition to perform the cloud computing, SaaS (software as a service), any one or more of the methodologies of the methodologies discussed herein, such as another computer, the cluster configuration for it should be taken to include any collection of machines of the running set (or multiple sets) of instructions to individually or jointly. 여기서 설명되는 바와 같이, 예들은 로직 또는 다수의 구성요소들, 모듈들 또는 메카니즘들을 포함하거나 이들 상에서 동작할 수 있다. As described herein, for example, it may include the logic or a number of components, modules, or mechanisms, or operating on them. 모듈들은 특정 동작들을 수행할 수 있는 유형 개체이며, 소정의 방식으로 구성 또는 배치될 수 있다. Modules and types of objects that may perform certain operations, may be configured or arranged in a predetermined manner. 예에서, 회로들은 모듈과 같이 특정 방식으로 (예를 들어, 내부적으로 또는 다른 회로들과 같은 외부 개체들과 관련해서) 배치될 수 있다. In this example, circuits in a particular way as the module may be (e.g., by internally or connection with an external object, such as another circuit) arrangement. 예에서, 하나 이상의 컴퓨터 시스템(예를 들어, 스탠드얼론, 클라이언트 또는 서버 컴퓨터 시스템) 혹은 하나 이상의 하드웨어 프로세서의 전체 또는 일부는 특정 동작들을 수행하도록 동작하는 모듈과 같이 펌웨어 또는 소프트웨어(예를 들어, 인스트럭션, 애플리케이션 포트, 또는 애플리케이션)에 의해 구성될 수 있다. In the example, one or more computer systems of all or some of (e.g., a standalone, client or server computer system) or one or more hardware processors for firmware or software (such as the module operates to perform certain operations, the instruction , it may be configured by an application port, or application). 예에서, 소프트웨어는 (1) 비일시적 기계 판독가능 매체 상에 또는 (2) 전송 신호에 존재할 수 있다. Yes, the software (1) may be present in the non-transient machine-readable medium on or (2) the transmitted signal. 예에서, 모듈의 기본적인 하드웨어에 의한 실행시에, 소프트웨어는 특정 동작들을 하드웨어가 수행하게 한다. In the example, when executed by the underlying hardware of the module, the software makes the hardware perform the specific action. 따라서, "모듈"이란 용어는 물리적으로 구축되고, 특정하게 구성되는(예를 들어, 하드와이어드), 또는 여기서 설명되는 임의의 동작의 일부 또는 전체를 수행하거나 특정 방식으로 동작하도록 임시로(예를 들어, 일시적으로) 구성된(예를 들어, 프로그래밍된) 개체인 유형 개체를 포함하도록 이해된다. Accordingly, the "module" refers to being built physically, that is particularly configured (e.g., hardwired), or perform some or all of any of the operations described herein, or (for example, temporarily to operate in a particular manner g., it is understood (e.g. configured to temporarily), to include a programmed) objects of type object. 모듈들이 임시로 구성되는 예들을 고려하면, 각 모듈은 시간적으로 어떤 한 순간에 인스턴스화될 필요는 없다. Considering the example in which the modules are composed of a temporary, each module is not in time to be instantiated at any one moment. 예컨대, 모듈들이 소프트웨어를 이용해서 구성되는 범용 하드웨어 프로세서를 포함하는 경우, 범용 하드웨어 프로세서는 상이한 시간에 각각의 상이한 모듈들로서 구성될 수 있다. For example, in the case of general purpose hardware including a processor modules it is configured using a software, hardware, a general-purpose processor may at different times can be configured as respective different modules. 따라서, 소프트웨어는, 예를 들어 한 순간에 특정 모듈을 구축하고 또한 다른 순간에 다른 모듈을 구축하기 위해 하드웨어 프로세서를 구성될 수 있다. Thus, the software may be configured for the hardware processor for building a particular module at a time instance, and also to establish a different module in another moment. 머신(예를 들어, 컴퓨터 시스템 또는 디바이스)(800)은 하드웨어 프로세서(802)(예를 들어, 프로세싱 유닛, GPU, 하드웨어 프로세서 코어, 또는 그것들의 임의의 조합), 메인 메모리(804), 및 정적 메모리(806)를 포함할 수 있고, 이들 중 일부 또는 전체는 링크(808)(예를 들어, 버스, 링크, 상호접속부, 등)를 통해 서로 통신할 수 있다. Machine (e. G., Computer system or device) 800 includes hardware processor 802 (e. G., Processing unit, GPU, hardware processor cores, or those of any combination), a main memory 804, and static may include a memory 806, some or all of which may communicate with each other via a link 808 (e. g., bus, link, interconnects, and so on). 머신(800)은 디스플레이 디바이스(810), 입력 디바이스(812)(예를 들어, 키보드) 및 사용자 인터페이스(UI) 탐색 디바이스(814)(예를 들어, 마우스)를 더 포함할 수 있다. Machine 800 may further include a display device 810, input device 812 (e.g., a keyboard) and user interface (UI) navigation device 814 (e.g., a mouse). 예에서, 디스플레이 디바이스(810), 입력 디바이스(812), 및 UI 탐색 디바이스(814) 터치스크린 디스플레이일 수 있다. In the example, it may be a display device 810, input device 812, and UI navigation device 814, the touch screen display. 머신(800)은 대용량 저장장치(예를 들어, 드라이브 유닛)(816), 신호 생성 디바이스(818)(예를 들어, 스피커), 네트워크 인터페이스 디바이스(820), 및 GPS 센서, 카메라, 비디오 레코더, 컴퍼스, 가속도계, 또는 다른 센서와 같은 하나 이상의 센서들(821)을 추가적으로 포함할 수 있다. Machine 800 includes a mass storage device (e.g., the drive unit) 816, a signal generation device 818 (e.g., a speaker), a network interface device 820, and a GPS sensor, a camera, a video recorder, compass, may additionally include an accelerometer, or one or more other sensors such as sensor 821. 머신(800)은 하나 이상의 주변 디바이스(예를 들어, 프린터, 카드 판독기 등)를 통신 또는 제어하기 위해 직렬(예를 들어, USB, 병렬, 또는 다른 유선 또는 무선(예를 들어, 적외선(IR)) 접속과 같은 출력 제어기(828)를 포함할 수 있다. Machine 800 includes a series (e.g., USB, parallel, or other wired or wireless (e.g., infrared (IR) to one or more peripheral devices (e.g., printers, card readers, and so on) communication or control ) may include the output controller 828, such as a connection. 대용량 저장장치(816)는 여기서 설명되는 기술들 또는 기능들 중 임의의 하나 이상의 것에 의해 이용되거나 이를 구현하는 인스트럭션(824)(예를 들어, 소프트웨어) 또는 데이터 구조들의 하나 이상의 세트를 저장한 머신 판독가능 매체(822)를 포함할 수 있다. Mass storage device 816 is described or features of the utilized by any one or more of, or instructions 824 to implement them (e.g., software), or storing the one or more sets of data structures, machine readable described herein It may include a medium (822). 인스트럭션(824)은 또한 메인 메모리(804) 내에, 정적 메모리(806) 내에, 또는 머신(800)에 의한 실행시에 하드웨어 프로세서(802) 내에, 완전히 또는 적어도 부분적으로 있을 수 있다. Instructions 824 may also be in the in the main memory 804, static memory, hardware processor 802 during execution by, or machine (800) in (806), completely or at least partially. 예에서, 하드웨어 프로세서(802), 메인 메모리(804), 정적 메모리(806), 또는 대용량 저장장치(816)의 임의의 조합 또는 이들 중 하나는 머신 판독가능 매체를 구성할 수 있다. In the example, the hardware processor 802, main memory 804, any combination of a static memory 806, or mass storage device 816, or one of which may constitute a machine-readable medium. 머신 판독가능 매체(822)가 단일 매체로서 도시되어 있지만, "머신 판독가능 매체"의 용어는 하나 이상의 인스트럭션(824)을 저장하도록 구성된 단일 매체 또는 다수의 매체(예를 들어, 중앙형 또는 분산형 데이터베이스, 및/또는 연관 캐쉬 및 서버)를 포함할 수 있다. A machine-readable medium 822 is shown as a single medium, but the "machine readable medium" of the term single medium or multiple media configured to store one or more instructions 824 (e.g., a centralized or distributed It may include a database, and / or associated caches and servers). "머신 판독가능 매체"의 용어는, 머신(800)에 의한 실행을 위한 인스트럭션을 저장, 인코딩, 또는 전달할 수 있으며, 머신(800)으로 하여금 본 발명의 기술들 중 임의의 하나 이상의 기술을 수행하도록 하게 하고, 혹은 이러한 인스트럭션과 연관되거나 그에 의해 사용되는 데이터 구조를 저장, 인코딩 또는 전달할 수 있는 임의의 유형 매체를 포함할 수 있다. The term "machine-readable medium" is stored, may be encoded, or to pass the instruction for execution by the machine (800), cause the machine 800 to perform any one or more techniques of the techniques of the present invention and the, or may be associated with this instruction includes any type of medium capable of storing, encoding or forward the data structures used by him. 비제한적인 머신 판독가능 매체의 예들로는 고체-상태 메모리, 및 광학 및 자기 매체가 포함될 수 있다. Non-limiting examples of a machine-readable medium include solid-state memory may be included, and optical and magnetic media. 머신 판독가능 매체의 특정 예들로는: 반도체 메모리 디바이스(예를 들어, EPROM, EEPROM) 및 플래시 메모리 디바이스와 같은 비휘발성 메모리; A specific example of machine-readable media include: semiconductor memory devices (e.g., EPROM, EEPROM) and a nonvolatile memory such as flash memory devices; 내부 하드 디스크 및 분리가능 디스크와 같은 자기 디스크; Magnetic disks such as internal hard disks and removable disks; 광자기 디스크; Magneto-optical disks; CD-ROM 및 DVD-ROM 디스크를 포함할 수 있다. It may include a CD-ROM and DVD-ROM disks. 인스트럭션(824)은 다수의 전송 프로토콜(예를 들어, 프레임 릴레이, 인터넷 프로토콜(IP), 전송 제어 프로토콜(TCP), 사용자 데이터그램 프로토콜(UDP), 하이퍼텍스트 전송 프로토콜(HTTP), 등) 중 임의의 하나를 이용하는 네트워크 인터페이스 디바이스(820)를 거쳐서 전송 매체를 이용하는 통신 네트워크(826) 상에서 추가로 전송 또는 수신될 수 있다. Instruction 824 is a plurality of transport protocol (e.g., frame relay, Internet Protocol (IP), Transmission Control Protocol (TCP), User Datagram Protocol (UDP), Hypertext Transfer Protocol (HTTP), etc. ), any of the via the network interface device 820 using one may be sent or received over the further communication network 826 using a transmission medium. "전송 매체"의 용어는 머신(800)에 의한 실행용 인스트럭션을 저장, 인코딩 또는 전달할 수 있는 임의의 비유형 매체를 포함하도록 취해져야 하고, 또한 이러한 소프트웨어의 통신을 가능하게 하기 위해 디지털 또는 아날로그 통신 신호 혹은 다른 비유형 매체를 포함한다. "Transmission medium" of the term should be taken to include any non-tangible medium that can store, encoding or forward the instruction for execution by the machine (800), and also a digital or analog communication to enable the communication of the software and a signal or other non-tangible media. 실시예들은 하드웨어, 펌웨어 및 소프트웨어의 조합 또는 이들 중 하나로 구현될 수 있다. Embodiments may be implemented as one or a combination of these hardware, firmware and software. 실시예들은 또한 컴퓨터 판독가능 저장 디바이스에 저장된 인스트럭션으로서 구현될 수 있고, 상기 인스트럭션은 여기서 설명되는 동작들을 수행하기 위해 적어도 하나의 프로세서에 의해 판독 및 실행될 수 있다. Further embodiments may be implemented as instructions stored on a computer-readable storage device, the instructions may be by at least one processor to perform the operations described herein read and executed. 컴퓨터 판독가능 저장 디바이스는 머신(예를 들어, 컴퓨터)에 의해 판독가능한 형태로 정보를 저장하는 임의의 비일시적 메카니즘을 포함할 수 있다. Computer program devices machine (e.g., a computer) may include any non-mechanism for temporarily storing information in a form readable by. 예컨대, 컴퓨터 판독가능 저장 디바이스는 ROM, RAM, 자기 디스크 저장 매체, 광학 저장 매체, 플래시-메모리 디바이스, 및 다른 저장 디바이스 및 매체를 포함할 수 있다. For example, the computer readable storage devices include ROM, RAM, magnetic disk storage media, optical storage media, flash may include a memory device, and other storage devices and media. 여기서 논의되는 예시적인 실시예들은 모든 형태의 무선 네트워크 액세스 공급자들에 의해 이용될 있고, 상기 모든 형태의 무선 네트워크 액세스 공급자들은 비용 회피(cost-avoidance) 및 성능 이득을 위해 셀룰러 오프로드 비율(cellular offload ratios) 증대를 고려하고 있는 모바일 광대역 공급자와, 고객들의 집 또는 회사 밖의 그들의 커버리지 풋프린트(coverage footprint) 확장을 고려하고 있는 고정된 광대역 공급자와, 액세스 소비자들 또는 장소 소유자들(venue owners)을 거쳐 액세스 네트워크들을 현금화(monetize)하는 것을 고려하고 있는 무선 네트워크 액세스 공급자와, 무선 네트워크(예를 들어, 인터넷) 액세스, 또는 무선 네트워크 상에서의 디지털 서비스들(예를 들어, 위치 서비스, 광고, 연예 등)의 제공을 고려하고 있는 공공 장소(public venues), 및 게스트 인 Exemplary embodiments discussed herein can be used by any type of wireless network access provider, said any form of wireless network access providers cellular offload rate for cost avoidance (cost-avoidance), and a performance gain (cellular offload and mobile broadband provider you are considering an increase ratios), and fixed broadband providers are considering other customers home or office their coverage footprint (coverage footprint) extend, through to the access to consumers or place the owner (venue owners) and wireless network access provider considering the access networks realized (monetize), wireless networks (e.g., Internet), digital services on the access, or a wireless network (e.g., location services, advertising, entertainment, and so on) public places that are considered to provide (public venues), and a guest 넷 액세스 또는 BYOD(Bring- Your-Own-Device) 액세스를 단순화하길 원하는 회사, 교육적 또는 비영리 기업을 포함하지만 이들로 제한되진 않는다. Net access or BYOD (Bring- Your-Own-Device) including companies, educational or non-profit company wants to simplify the access, but not limited to, doejin. 기술적인 기재내용의 특성 및 요지를 독자가 확인할 수 있도록 요약서가 제공된다. The nature of the technical disclosures and addresses the summaries are provided so that the reader can identify. 이는, 청구항들의 범위 또는 의미를 제한 또는 해석하는 데 사용되지 않을 것이라는 이해와 함께 제출된다. It is submitted with the understanding that it will not be used to interpret or limit the scope or meaning of the claims. 이하의 청구항들은, 청구항 각각이 그 자체로서도 별도의 실시예로서, 상세한 설명에 포함된다. The following claims are, respectively, as a separate embodiment of this aspect also as such, are included in the description. 정밀 타이밍 측정 방법. Precision timing measurement. 머신 판독가능 매체. A machine-readable medium.